In case you didn’t notice, for the last couple months there has been a cool little icon on the sidebar of my blog titled “Blogging for Hunger”. 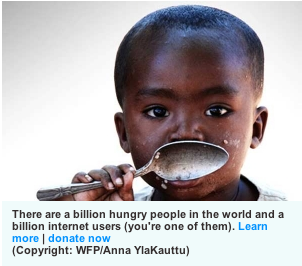 The World Food Programme has initiated new tools for us bloggers to get in on spreading the word for the Hunger crisis going on around the world. “A Billion for a Billion” is a new campaign designed to harness the social network of the internet to spread the word about what’s really happening, and how we can help. If everyone donates a $1.50 a week, there can be tremendous changes made. Seriously, $1.50 a week.